There has been a recent debate in the scientific literature about the effect of predators on invasive lionfish. Are Caribbean predators controlling the lionfish invasion? Two studies seem to have conflicting results. Is someone “lyin'” about lionfish? See previous post, The Great Debate: Predators vs Lionfish, for background on the lionfish invasion and more info on the two studies. Lionfish are predators from the Pacific that have invaded the Caribbean. They are expected to have many negative impacts on Caribbean coral reefs, but it is unclear how we can control this invasion. Can native predators control invasive lionfish? Mumby et al. 2011 performed a small scale study and found fewer lionfish on sites within Exuma Cays Land and Sea Park that have a lot of grouper. They suggested that grouper can control the lionfish invasion. Hackerott et al. 2013 performed a large scale analysis and found no relationship between the amount of lionfish and grouper. However, they included other variables in their analysis and found that there were fewer lionfish in marine protected areas, most likely due to lionfish removals from reef managers. They concluded that native predators (like grouper) are not controlling lionfish, but that active management (like removing them from reefs) can reduce their abundance. How can two studies testing the same question come up with opposite conclusions? One must be wrong, right? Not necessarily. Mumby et al. posted a rebuttal to Hackerott et al. suggesting that their conclusions are inaccurate. However, Mumby et al.’s claims were false and Hackerott et al. support their initial conclusions in a second response paper. One of Mumby et al.’s main critiques was that Hackerott et al. did not include other important factors that could control lionfish. However, the goals of Hackerott et al. were to determine how predators, as well as other factors, influenced lionfish, so this claim is just not true. Hackerott et al. included 6 other variables, 4 of which affected lionfish. In their response, they added two additional variables, but this did not change their initial conclusions: predators had no effect on lionfish. Factors other than the amount of predators were more important in controlling lionfish. Mumby et al.’s second critique was that the sites of Hackerott et al. 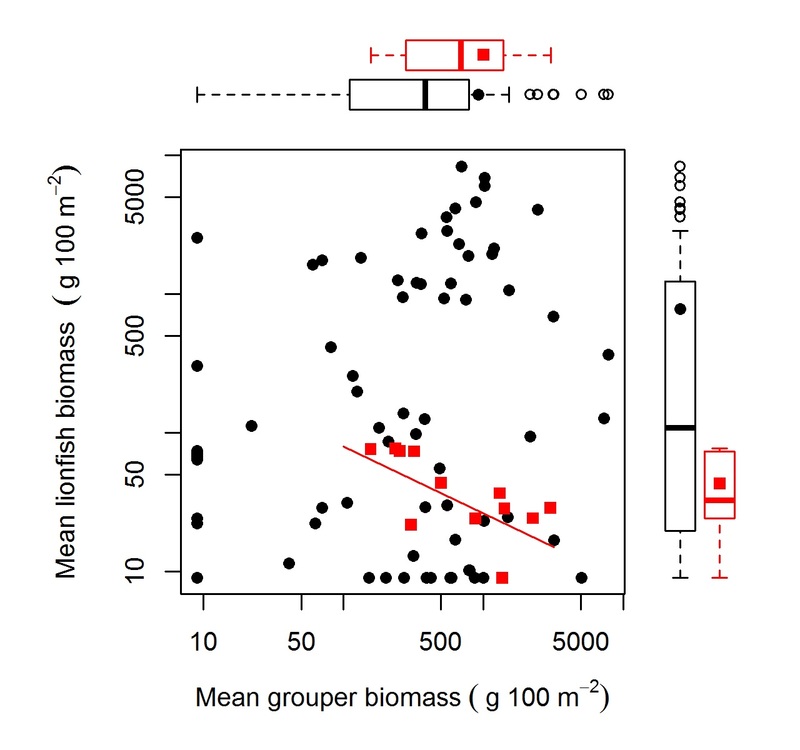 did not have large enough grouper to control lionfish, yet Hackerott et al. actually had sites with more grouper than Mumby et al., many of which were the size Mumey et al. classified as “large.” So although there were plenty of large grouper, these predators still had no effect on lionfish. Mumby et al.’s final critique was criticizing how Hackerott et al. analyzed their data. Mumby et al. claimed there was a relationship in Hackerott et al.’s data between lionfish and grouper at sites with a large amount of grouper. However, the visual relationship on which Mumby et al. based this, was driven by 6 out of 71 sites, 5 of which were in protected areas. Therefore this “relationship” that Mumby et al. proposed was due to protection status, not the amount of grouper, as initially explained in Hackerott et al. 2013. So what else can explain this discrepancy? First we have to think about the differences in scale. Mumby et al. 2011 was a small scale study (12 sites) while Hackerott et al. was much larger scale (71 sites). Also Mumby et al. focused on one specific place (The Bahamas), while Hackerott et al. wanted to see if there was a relationship that could be seen across the Caribbean region (The Bahamas, Cuba, Belize, Mexico). 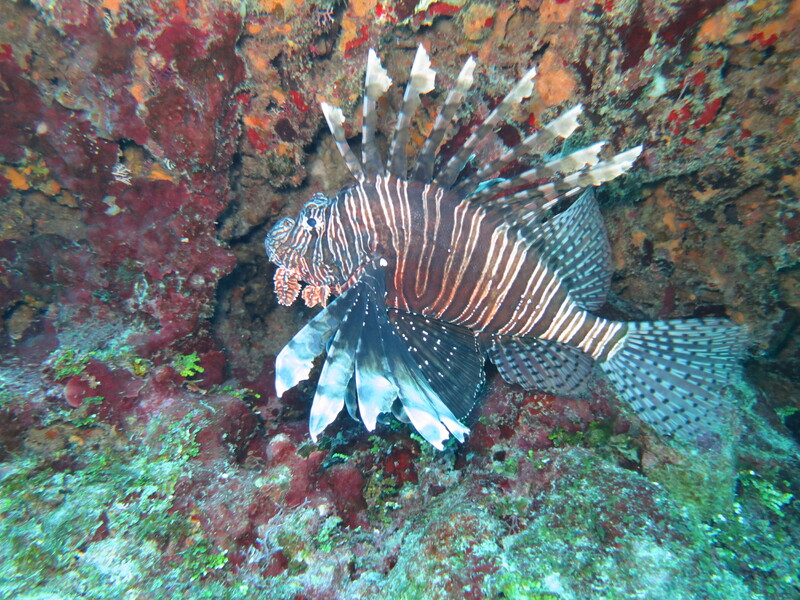 It is possible that grouper are controlling lionfish in the Exuma Cays Land and Sea Park. Yet, this relationship is not seen on a larger scale across a wide range of sites in the Caribbean. Therefore native predators are not a reliable control for the lionfish invasion across the Caribbean region. Also, the abundance of lionfish that Mumby et al. found is quite small (1-10% of Hackerott et al.’s min and max) compared to the range found in Hackerott et al. It is possible that grouper can reduce the amount of lionfish at the beginning of the invasion or when there are very few lionfish. However, this is not a useful method to control lionfish across the entire Caribbean region where lionfish populations are now established. Another key difference is that Hackerott et al. 2013 included other variables, besides the amount of predators, that could control lionfish. For example, Hackerott et al. found that there were fewer lionfish in marine protected areas, yet this relationship had nothing to do with the amount of predators. It is possible that factors other than grouper abundance are important in the relationship found by Mumby et al., but further analysis would be necessary to test this. Are predators, like grouper and sharks, eating lionfish? It is possible. Lionfish have been found in the stomach contents of two grouper and there are anecdotes of divers feeding a speared lionfish to a grouper or shark. However, there is no evidence that native predators are eating lionfish naturally, and trying to “train” native predators to eat lionfish from spears is quite dangerous. Instead of predators associating “lionfish” with “food”, they are associating “divers” with “food”. Now I’ve been diving for 10 years and have not once felt threatened by a shark, but I don’t think I would like it if sharks started to expect me to bring snacks. Whether predators are eating lionfish or not is not really the question. The important thing is that this predation pressure is not large enough, compared to other factors, to control invasive lionfish across the Caribbean. Protecting and restoring predator populations is extremely important, but that will not help mitigate the lionfish invasion. Predators are not controlling lionfish, so we have to! Spear lionfish, compete in lionfish derbies, and support restaurants that serve lionfish. Tags: Bahamas, Caribbean, Exuma Cays Land and Sea Park, Great Debate, Grouper, Lionfish. Bookmark the permalink. I really liked this article. I have only recently become involved through a recent session at ReefCI. My own thoughts as a layman (so please forgive any errant terminology) were, that wherever there were lionfish there was less evidence of a vibrant reef and very definately a marked space where a thriving juvenile colony should have been. Whether or not a natural predator is developing is a mute point at this stage. The negative impact of lionfish is a “happening now” event, and it’s my opinion that we cannot wait for natural predators to develop. Thank you for the feedback! You are exactly right. Although a small scale reduction in lionfish may be interesting, it is not relevant to current invasion management decisions. Yes, grouper should be protected, but this will take time. Lionfish, however, need to be controlled now and current grouper populations are not going to provide enough control. We can make a difference, though! Derbies are a great way to remove lionfish and spread the word about the invasion! Great to hear that you are getting involved!